The Klingberg Children’s Advocacy Center (KCAC) held an open house on Friday, Nov. 2, in celebration of its one-year anniversary. In attendance were Congressman John Larson, funders, and community partners. The event allowed the KCAC to showcase its space to stakeholders, highlight program milestones, and express appreciation to those that have supported its first year of operation. The KCAC exists to provide compassionate and effective help to children who have been victims of abuse. Upon disclosing abuse, the child is referred to the KCAC to be interviewed by a Forensic Interviewer who is trained to gather all necessary information in a way that promotes accuracy and limits the trauma to the child. A Family Advocate walks the family through the entire life of the case, from the moment they walk through the doors of the KCAC through the prosecution of the perpetrator, providing support and connection to Klingberg treatment (e.g., outpatient counseling) and community resources. “In the short time since we opened this program we have expanded from serving only Hartford to also serving New Britain, Enfield, Manchester, and Tolland. 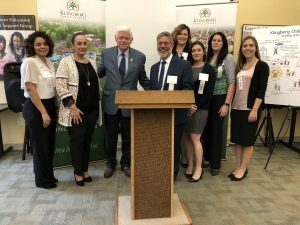 We would like to thank the Connecticut Children’s Alliance, the Department of Children and Families, and our Multidisciplinary Team partners for the opportunity to provide this critical service for children who are victims of abuse, and the Office of Victim Services for funding the forensic interviews that we provide,” says Steve Girelli, President/CEO.